A natural chemical free alternative to regular pain killers for teething pain. Reduce baby drooling as a result of teething. Reduces red cheeks and inflamation. Baby Jewelry for teething babies. The best range and prices in Australia. Amber Necklace, Amber Anklet, Amber Bracelet, Sets, available in Raw Amber and Polished Amber. How Does Baltic Amber Help Teething? Baltic amber contains an active ingredient called Succinic Acid which is absorbed through contact with the skin. Traditionally Succinic Acid has been used to relieve a number of symptoms including those related to baby teething. Are Different Colours Of Amber Better? Some sellers will claim that lighter colours are more affective as a remedy for teething symptoms, however there is no information to say that the active ingredient level varies between the natural colours of Baltic amber. However it is a fact that some colours are harder to source than other so this can lead to variations in prices. Which Amber Necklaces Are Better For Teething? The main difference between Baltic amber designs as a teething remedy is Raw Vs Polished beads. It's widely speculated that Raw beads have more available active ingredient when compared to Polished beads, however both still have it. There is no difference in active ingredient between the natural colours of Baltic amber. What's The Difference Between Raw & Polished Amber Beads? Most sources believe that Raw beads have more of the active ingredient (Succinic Acid) available when compared to Polished beads. However, while it may have less when compared to Raw, it is known that Polished beads do still contain the active ingredient and are also used as a traditional teething remedy. Visually, Raw amber beads have a sort of frosted glass look, where as polished is more transparent and shiny. Both are smooth to touch to the point you won't notice any difference in that regard when wearing. Are Gemstone Designs Also For Teething? While most of our designs are 100% Baltic amber, we do also stock semi-precious gemstone + amber combination designs. You can easily see which designs are not 100% Baltic amber because they will say "Gemstone" in their product name. Keep in mind that while gemstone + amber jewellery does still contain the active ingredient Succinic Acid in the amber beads; gemstones are generally not considered a teething remedy and so these designs are presumed to have less active ingredient compared to amber only designs. This can easily be compensated for a bit by wearing a gemstone + amber necklace + anklet/set to increase the number of amber beads in contact with the skin. Baltic amber is a natural product formed from fossilised tree resin, specifically from the Baltic region of eastern Europe. Amber from this region contains a compound called Succinic Acid, which is the active ingredient associated with relieving the symptoms of teething. WILDBUBZ® Brand LUXE | PERSONALISED | BABY NAME | Teething Jewellery made in Australia with Lab ..
Purchase a custom Baltic amber extension piece which can be used to add length to any necklace, ankl..
+ New premium BEAN sized Baltic Amber! + Premium BEAN Golden Honey Ombre hand shaped&nb..
*NEW* Premium bud sized, Honey Ombre - Polished baltic amber premium bud sized hand shape..
•new• Premium bud sized, Amethyst Gemstone + Palest Lemon Baltic Amber Set - Po..
*NEW* PALE Blue Ombre Rainbow Gemstone + Baltic Amber Set - Polished baltic amber pre..
•new• Premium bud sized, Lapis Lazuli Gemstone + Palest Lemon Baltic Amber .. Premium bud sized, Lilac Amethyst Ombre Rainbow Gemstone + Baltic Amber Set - Polished bal.. Premium bud sized, MINTY Ombre Rainbow Gemstone + Baltic Amber Set - Polished baltic ..
Rose Quartz + Striped Agate | Pink Ombre Gemstone + Baltic Amber Set - Polished balti.. Premium bud sized, Pink Ombre Rainbow Gemstone + Baltic Amber Set - Polished baltic a.. 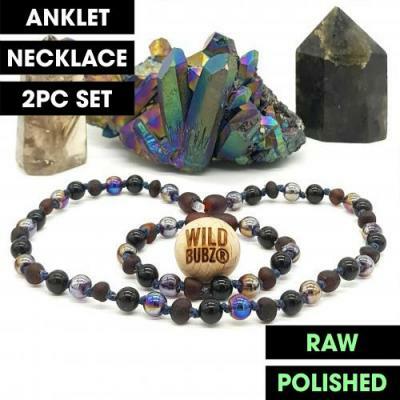 Premium bud sized, Pastel Pink Rose Quartz Gemstone + Palest Lemon Baltic Amber Set - Polished&..
•new• Premium bud sized, Rainbow Gemstone + Baltic Amber Set - Polished ba..
WILDBUBZ® Brand LUXE | Rose Quartz Aura Crystals + Raw Max Genuine Baltic Amber +..
WILDBUBZ® Brand LUXE | Amethyst Aura | Raw Max Genuine Baltic Amber + Premium Qua..
WILDBUBZ® Brand LUXE | Black Rainbow Aura | Raw Max Black Cherry Genuine Baltic A..
WILDBUBZ® Brand LUXE | Blue Aura | Raw Max Genuine Baltic Amber + Blue Aura ..
UNICORNS + Hazlewood | Soft Pastels | Ombre Gemstone + Baltic Amber Set - Polished ba..
•new• Premium bud sized, Double Honey Ombre Set - Polished baltic amber premium..
+ NEW Premium Bean shaped Honey Ombre Set - Polished baltic amber baroque hand shaped ..
WILDBUBZ® Brand LUXE | Tropical Ombre | Raw Max Size Genuine Baltic Amber + Fluorite + Jade..
UNICORNS | Soft Pastels | Ombre Gemstone + Baltic Amber Set - Polished baltic amber p..
WILD BUBZ® Brand LUXE | Ombre | Lapis lazuli, Howlite + Amber Premium bean s..
WILD BUBZ® Brand LUXE | LUNA | Ombre | Lapis lazuli, Howlite + Amber Premium bean.. Featuring genuine premium Bud polished Cherry / Honey Ombre hand shaped beads, which are larger..
+ New premium BEAN sized Baltic Amber! + + Premium BEAN Cherry Baltic Amber - hand shaped..
+ New premium BUD sized Baltic Amber! + + Premium BUD Polished Honey Baltic Amber - ..
+ New premium Rare Baroque Butter Baltic Amber! + Premium Rare Opaque Butter / butterscotch ..
+ New premium Rare Baroque Milky Butter Baltic Amber! + Premium Rare Butter / yellow Butters.. Featuring genuine Ombre Rainbow Baltic amber. Hand shaped Nugget size beads which ar..
Max Raw | Lemon, honey & golden honey ombre set. Raw baltic amber baroque sized h..
+ Premium Bean sized Baltic Amber! + Premium BEAN Raw Lemon baltic amber, hand shaped bea..
+ New premium RAW BEAN sized Baltic Amber! + + Premium BEAN Raw Rainbow Baltic Amber SET -&nbs..
+ New Geo Faceted hand shaped XL sized Baltic Amber pieces! + Polished Honey Faceted Geometric..
+ New premium Bud sized Raw Baltic Amber! + Premium BUD Honey Multi Ombre hand shaped beads th..
Necklace + anklet / bracelet set, featuring genuine Baltic amber in honey polished ombre + Orga.. This SET includes a necklace + anklet / bracelet, featuring genuine Baltic amber in honey raw&n..
+ New premium Baroque sized Baltic Amber! + + Premium Polished Cherry Baltic Amber - hand..
+ New Baroque sized Baltic Amber! + + Premium Baroque Golden Honey Baltic Amber - hand ..
+ New premium Baroque sized Baltic Amber! + + Premium Baroque Rainbow Honey Ombre Balti..